Thank you for this! Loved reading this. :) Merry Christmas to you and Parker! And Jenny too!! Jenny looks like such a diva in the picture! I love it! Merry, merry Christmas to you and your family! I pray that you all enjoy quality time with loved ones while celebrating the birth of our Lord and Savior! Love the card! Have a very merry Christmas! Merry Christmas to you and yours! And I LOVED the card! Wishing you the merriest of Christmases!! XOXO! I love the card! I hope you have a Merry Christmas! I hope you and your family have an amazing Christmas, dear girl! 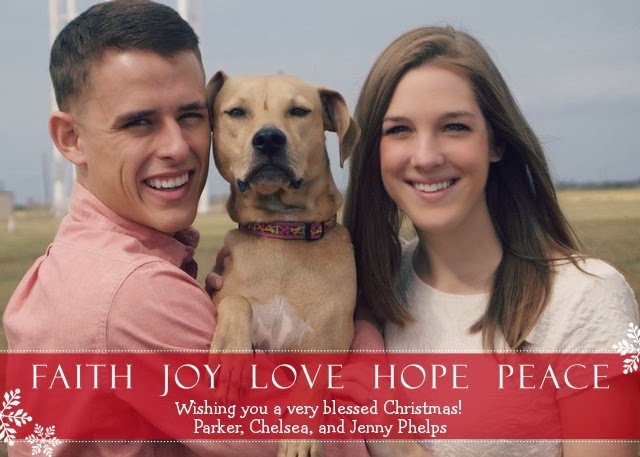 Such a cute Christmas card.